Paul Phillips has been using McMillan Fiberglass Stocks for nearly three decades. Our relationship goes back to when Paul left the service after serving our country as an Infantryman in the United States Marine Corps. He contacted Gale McMillan back then wanting the best riflestock for hunting and competitive shooting, and Gale got him what he needed. Settling on a .300 Win Mag, Paul not only had a new hunting rifle, but he started winning matches with it at Camp Perry. McMillan still offers a wide variety of the best Winchester compatible fiberglass stocks on the market — and just as Gale helped Paul, customer service remains the center of our brand’s philosophy. Paul said that by the ‘90s McMillan was a household name in the service, that he knew exactly who he needed to contact for his gun build. Several of our products have come directly out of collaborations with Paul. All these years later, he continues working closely with our company, helping us improve our products and importantly, breaking new ground in the competitive shooting and extreme long range (ELR) worlds. Recently, Paul made the longest confirmed shot on target. Not only did he do it with a McMillan stock, but Kelly McMillan was there to witness this feat. 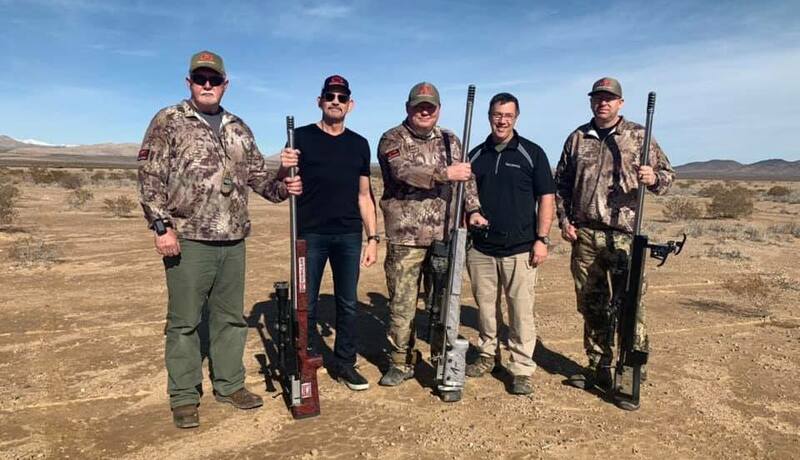 On January 19 in the desert outside Las Vegas, days before Shot Show 2019, Paul and his Global Precision Group team (Mark Lonsdale and Derek Rodgers) were preparing to take a 6,012-yard shot. With the main goal being ELR practice at 1–2 miles, it was a last-minute collaborative effort between sponsors, GPG, and their forward observers (Mauro Del Mastro and John Droelle) to push the limits of ELR. Paul had to put the rifle together and mount the scope on site that morning. After positioning a custom 11-mile camera system designed by Alex Cordesman, to monitor the target, they began shooting. The TACOMHQ Charlie Tarac mounts to the front of a riflescope and adds up to 800 MOA of elevation without adding or changing the gun’s rails, rings, or zero, and allowing for full magnification. Their Delta Tarac shifts the image center line in the scope to the side, because at a certain MOA the barrel and muzzle become visible in the scope at those extreme elevations. At that range, team GPG’s shot was at 625 MOA on a Nightforce 7-35×56 ATACR with the TACOMHQ Charlie and Delta attached. It wasn’t chance that Paul’s gun had a McMillan stock. He selected the McMillan ELR Beast 1 for this build because he recognizes the benefits and long-range capabilities of our fiberglass stocks. 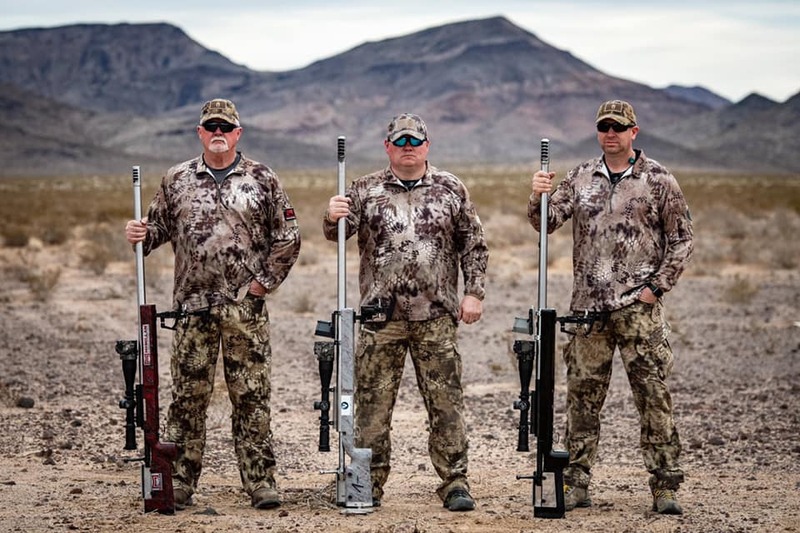 Paul was on the team of two King of 2 Miles champions, Mitch Fitzpatrick in 2016 and Derek Rodgers in 2017, who both placed first using a McMillan stock. Derek and Paul are 2 of 4 ever to hit the full 2-mile target in KO2M history. For this 6,012-yard shot, Paul used a BAT 50 caliber action and a Bartlein 40” barrel chambered in 416 Barrett, but the McMillan ELR Beast is what held it all together. With Paul behind the gun, the target was 1/2 MOA across and 3/4 MOA tall at 6,012-yards (32” x 48”). Team GPG was simply seeing how far bullets would fly. They were also testing the Applied Ballistics Analytics, a computer program that’s key to calculating D.O.P.E. and dialing in ELR shots, at the farthest it’s ever been used. The farther the distance, the greater margin for errors both in design and predictions. It took 15 shots before Paul’s forward observers even saw a splash in the sand. The flight distance is 17.1 seconds, so Paul would shoot and then shoot again. 7 shots later, the 22nd bullet made contact towards the top of the target. The next shot had already been fired and came in about 1 MOA short. In the video on GPG’s Facebook, Paul jumps up from the gun, everyone is excited, he watches the monitor to confirm it himself and then goes over and hugs Kelly. Paul followed up for a total of 30 shots, and while only one made impact on target, the following shots were all within 10-yards of the target, some missing only by inches. Paul wants to prove that multiple hits are repeatable at that range, and this is the first step towards gathering the information and testing the equipment needed to do so. Paul and his GPG team are proven competitors. Derek is the reigning FTR World Champion, Mark is an internationally ranked competitor, and Paul is the reigning NRA ELR National Champion. They weren’t lobbing shots downrange hoping to hit; they were using state of the art equipment, testing and taking data in order to learn more about shooting at both practical ELR distances and future extreme endeavors. This was following Paul’s GPG test at a 4,125-yards earlier this year, where he hit on the 6th shot. Team GPG plans to conduct a 7,040-yard (4-mile) exhibition shoot soon. Again, in the name of data collection and testing what the equipment and computer programs are capable of at their outer-limits. “By doing these tests and pushing the boundaries, it gives us a good sampling of how important each item [variable] is,” Paul said. It took a team. Paul emphasized the importance of his help that day from Mark and Derek, including forward observers Mauro and John, technical support from Alex, and all his sponsors. McMillan is proud to be a part of this team as Paul and Global Precision Group continues to take ELR as far as it will go. Thank you to the other individuals and companies who made that a possibility. Check out their video of the shot. Now an accomplished F-Class and ELR competitor, thank you, Paul Phillips, for serving our country and for helping prove the McMillan brand in new and exciting ways.